Jean-Luc is perhaps married and definitely older but not American. On the day after Thanksgiving, which I have spent alone for the first time ever, he buys me a coffee and insists [my boyfriend] is cheating on me back home. He insists on my youth and my naïveté and my future alignment with his truths. We spend four hours together before I remember that I can just get up and go. 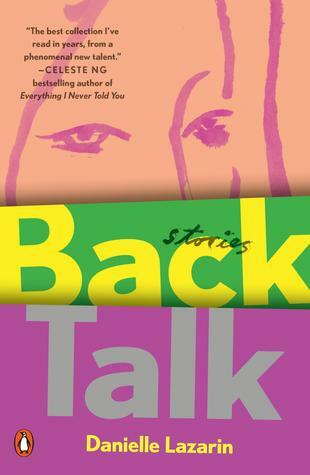 Although they might catch glimpses of their own desires, the women and girls of Back Talk are never given the space and grace to make sense of them without the constant hum of input from other people. In “Floor Plans,” a recent divorcée deals with her friends’ fretful, useless advice about how to repair her irreparable marriage; in “Lover’s Lookout,” a woman disoriented by a recent breakup has coffee with a man she meets in a park, but can’t decide what she wants from him, or if she’s just too tired to go through the motions of revealing herself to another person; in “Weighed and Measured,” a girl learns that her best friend’s cousin is attracted to her, and she wishes he weren’t even as she revels in her body’s new power. Lazarin’s writing ranges from fluid to flat (the opening story, “Appetite,” has some particularly awkward phrasing throughout, like when the narrator notes that her boyfriend “gave” her silence at a party, or that “the sound of the [cab] wheels going over the highway [was] like the gallops of a large horse”). But the strength of her prose lies in its ruthless realism, in the gems of moments that don’t announce themselves as such, choosing instead to blend into the surrounding mundanity. In fewer than four pages, the story “Window Guards” offers readers delicate reflections on mental illness, puberty, and male/female friendships, like when the narrator describes kissing her best friend as “just a comfort, an easy place to slip in and out of in the darkening afternoons.” The punch of the shortest stories displays Lazarin’s deftness with the form itself, capturing snapshot after snapshot of people’s daily lives mixed with quiet personal revelations. [His daughter’s] teachers called him in for “check-ins” nearly every month, though there wasn’t any real progress to report, just repeated suggestions that he seek more support. Acquaintances stopped him at the market, pulled him aside at soccer games, said, She should be here, and, I still can’t believe it. His face would turn into a sad mirror of theirs, and he would nod, even though it was impossible for him not to believe it: [his wife’s] death had been instantly real; she wasn’t there anymore. Claire finds Noah handsome, and wonders about the intimate details of his life, but she doesn’t fantasize about him. Instead, she worries about how she’s going to break up with her boyfriend, a kind, wonderful guy she just doesn’t love. After Noah’s disastrous date and Claire’s failed breakup attempt, they meet back on Noah’s lawn in a scene that beautifully defies expectations of how two people of their ages and situations would connect. The very qualities that make these stories successful – the quotidian details, the unassuming narrators, the quiet tone – tend to work against the collection as a whole, as it sometimes veers from subtlety into blandness, and the individual circumstances of the stories quickly become merged and mixed. But what readers can take away from Back Talk, more than any details, is a general feeling of ambivalence – a feeling that, if we were to look a little more closely, most of our relationships would also defy certainty and scripts. Jennifer Helinek is a book reviewer and EFL teacher working in New York.